Martial Blade Concepts (MBC) is an edged-weapon system specifically designed to meet the needs of today’s concerned citizen and armed professional. Based on Michael Janich’s extensive analysis of the Filipino martial arts and many other systems, MBC takes combat-proven tactics and adapts them to modern tools, threats, and legal concerns. The result is a practical, easy-to-learn system that is ideally suited to modern self-defense. 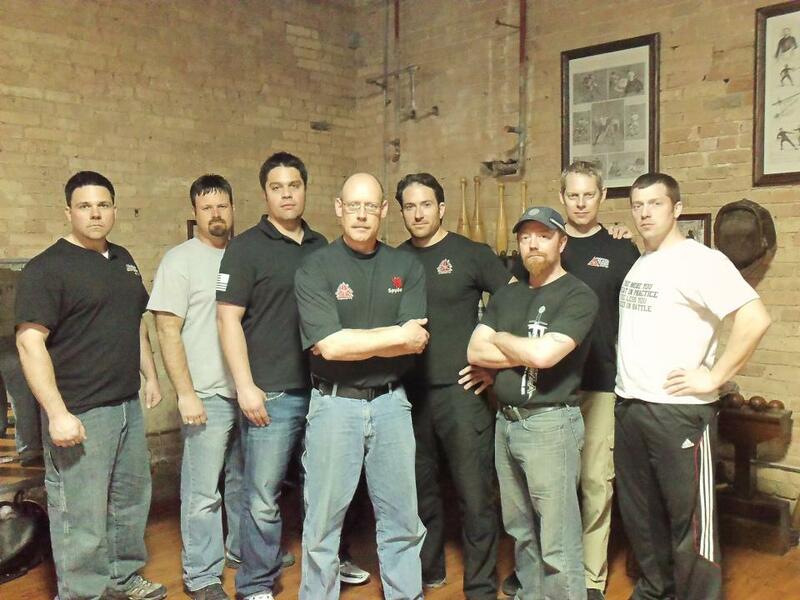 Mike Janich’s Martial Blade Concepts, as well as the adjutant systems of Counter Blade Concepts and Damithurt Silat (Practical Unarmed Combatves), is the base system four own Combatives program taught at Forteza. Students were very excited to train with the founder of the system they train in, most of whom had never met or trained with Mike before. 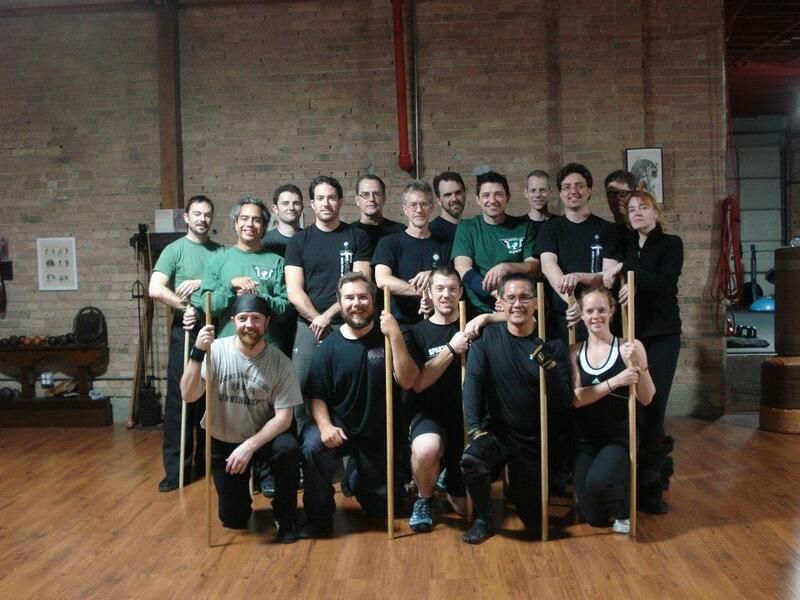 Forteza instructor Keith Jennings also ran a prep seminar two months prior, so by the time Mike arrived in Chicago, all of the students in attendance had a solid base level of skill, which allowed us to skip right past the basics, and jump right into the good stuff. Mike Janich takes Thayne for a big ride! Day One was dedicated to empty hand skills. Mike focused on taking the instinctual startle response, and educating it to make for a functional tool that can be used under stress. Students were brought through variations of the cycling drill, Hubud, and shoulder stops. Saturday ended with a look at Junkyard Aikido, his expression of joint-locking techniques. 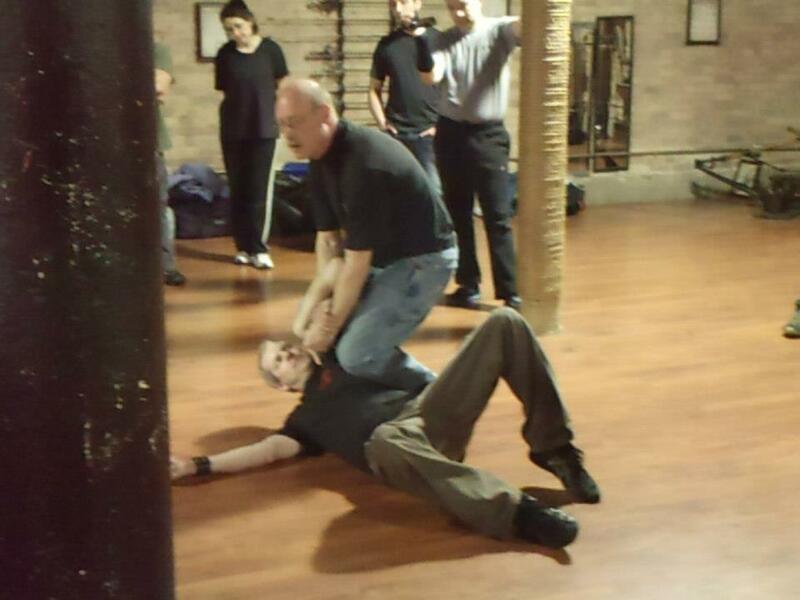 Focus was on how to apply joint locks in an actual combative situation, and to use them to either viciously stop the fight, or use the lock to transition to either a weapon or escape. Special shout out to visiting MBC alum Thayne Alexander for taking so many hard falls on the hard wood floor! It was an impromptu school of hard knocks style clinic on how to fall properly. Day two was Counter Blade Concepts, and how to transition from empty hand into knife deployment. Mike started with his signature video presentation which shows footage of actual knife attacks, and the aftermath of such an assault. The message was clear: knife attacks happen suddenly and violently, and seen over and over again in the footage were pre-fight indicators, off hand probing, and aggressive gross motor forehand thrusts and slashes predominately coming from right handed attackers. This reality check helped to bring a very serious tone to the day’s training, and with the problem clearly defined, Mike brought people through his counter-blade system. Rather than flashy disarms done against static attacks, focus was on shutting down the attack using a split X-defense, compression locking the attacking limb, mobility kills using low line knees and kick. 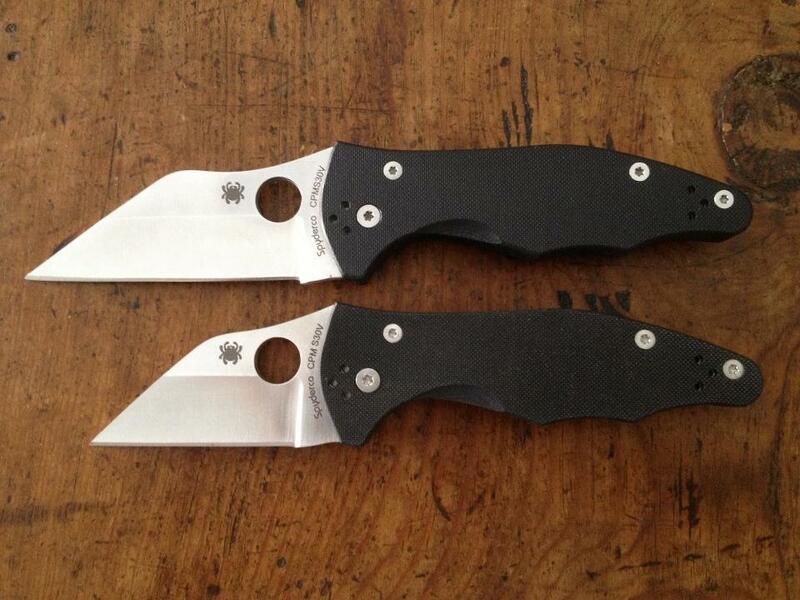 The MBC patented “Yojimbo” and its Chicago-legal little brother. Porkmen beware! After lunch, Mike set-up his famous “Porkman” demo: a pork roast attached to a PVC pipe and rigged with twine and Ceram wrap to provide a model of bone, muscle, tendons and skin. Forteza instructor Keith Jennings did the honors with his newly acquired “Chicagojimbo”, a modified Yojimbo 2 with the blade ground down to the legal Chicago length of 2.5 inches. Even with the shortened blade, and with very little effort, the knife had no problem cutting straight to the bone. This impressive demonstration showed not only how capable even a small carry knife can be, but also how dangerous it really is to face off against a knife attacker. With the demonstration fresh in the students’ minds, everyone trained with newfound enthusiasm and respect for what even a small blade is capable of. 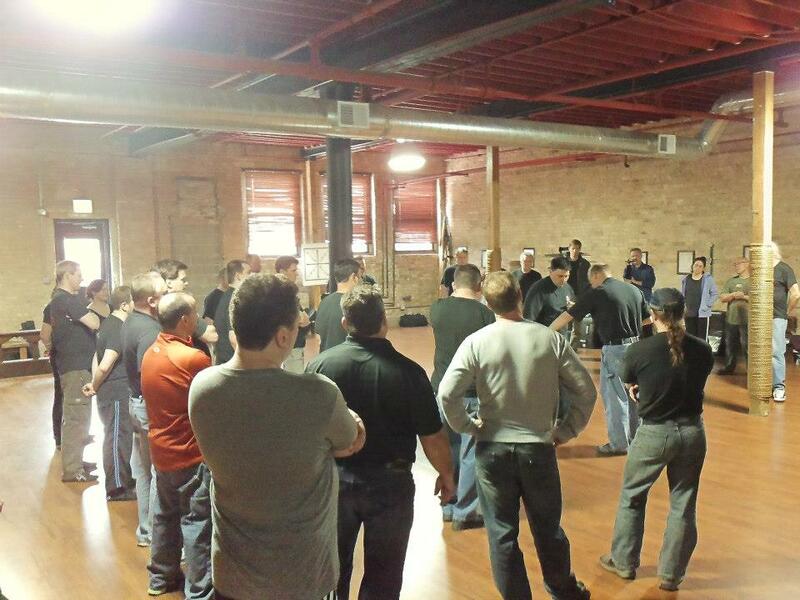 There were over forty people training on the floor, with room to spare. The positive feedback from the seminar was overwhelming, with everyone asking when we’ll have Mike back out for a follow-up seminar. The answer: as soon as we can! Thanks to Mike for making the trip out to Chicago, all of the MBC alumni from all over the Midwest who came out in support, and for all of the students in attendance who trained hard. Happy New Year! Not only is it the start of a new year, but we are closing in on the end of our first year together! 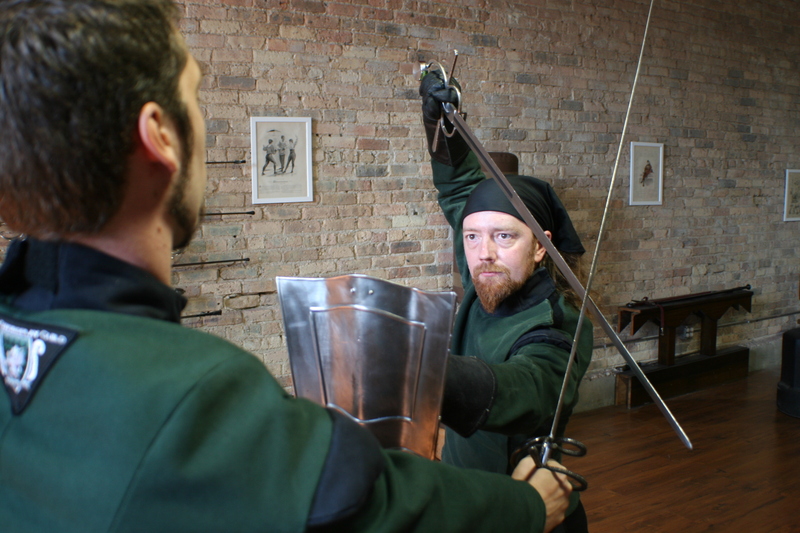 The concept for Forteza was born from three streams: Chicago Swordplay Guild founder and head instructor Gregory Mele was looking for a way to expand the Guild’s curriculum and training opportunities, and one of the Guild’s senior armizare students, Keith Jennings was looking to open his own personal training and combatives gym. When Tony Wolf offered to let the studio host his growing collection of 19th century exercise apparatus, a brilliant, if madcap idea was born…. To say that it has been a whirlwind of a year would be a gross-understatement. 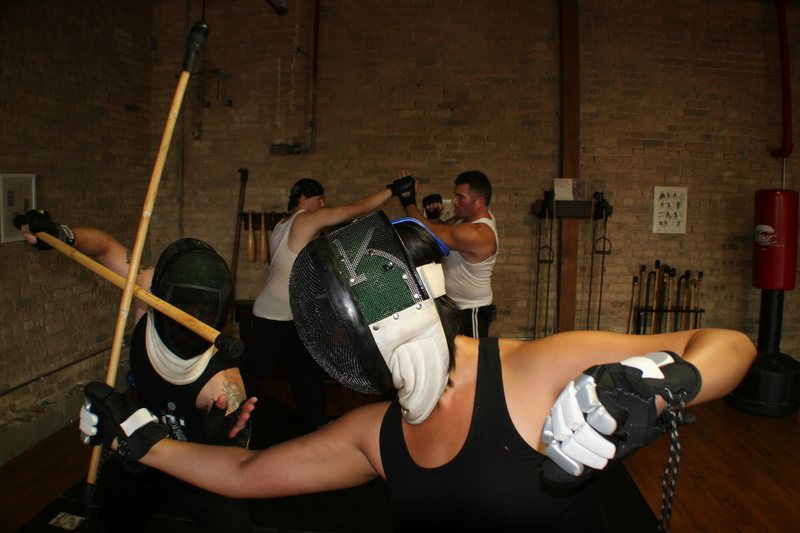 Since opening our doors, we’ve held seven rounds of introductory classes, an Open House, participated in the Ravenswood Art Walk, challenged our students with a Temple Burning work out, ran the Spartan Race, began work on our Clubhouse and introduced three new programs to the Chicagoland area: Bolognese fencing, Bartitsu and our unique Forteza Combatives Method. Forteza’s unique Fighting Fit program was also a big hit with the media, being showcased in the Chicago RedEye: Survival of the Fittest – train like a “Hunger Games” tribute with these offbeat exercises. That cover story caught the attention of WGN’s Jonathon Brandmeier. Jesse Kulla explained FightingFit to Johnny B on this PodCast (starting at 6:50), and was later invited to demonstrate on his TV show. But probably the best media look at what Forteza was all about came from this light-hearted feature on ABC 7′s 190 North! Forteza is proud to be hosting Maestro Roberto Laura on November 17 – 18 for a seminar on Italian knife and stick fighting. Mestro Laura has been spending years trying to document and preserve living traditions of Italian combatives, some of which are quite old. This will be his first visit to teach these arts in the United States. The first day of the workshop will include training in the knife system of two schools: i Cavalieri d’onore e d’umilita (Knights of Honor and Humility), an extremely old school of combat that derives from Manfredonia, Apulia in southern Italy (15th century). It is a highly specialised and elegant fighting system with the knife. Besides solo and partnered forms there are plenty of dueling positions which all have their respective tactical purposes. This school is NOT for self-defense! The intension is rather to survive or win dueling, to kill the opponent. The Cavalieri school also contains the fighting art with the shepherd stick and the straight-razor. The second is la Scuola Cielo e Meraviglia (the School of Heaven and Its Marvels) which also comes from Apulia, and is about two-hundred years old. This is a close-quarter fighting system which uses grips, joint locks, throws. As very old traditions these schools use a wide variety of daggers and folding knives, including cloak and dagger techniques and improvised weapons. The second day of the workshop will focus on using the Italian bastone – an approximately 4′ long walking staff/shepherd’s staff, as taught by in the Onore e d’Umilita school and in the modern Sicilian tradition. This is a very unique chance to study actual, living martial traditions of Italy, and we are hoping to do our part to see that these traditions not only survive in the 21st century, but get off of life-support. Once Roberto is gone, we’ll be developing a small study group to continue working with this material.